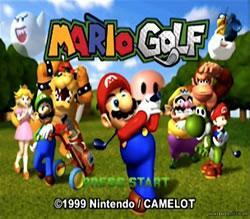 Mario Golf on the Nintendo 64 was another successful Golfing game by Camelot who were also responsible for a similarly successful golfing title on the Sony Playstation (Hot Shots Golf). Mario Golf 64 brings the game to you with four eighteen-hole courses and eleven golfers to choose from, with the most realistic play control to date. Level up your golfer in an RPG style, the more you play your character the more skill and experience you will gain reducing in more accurate shots and powerful swings. Mario Golf 64 is able to interact with Mario Golf on the Game Boy Colour enabling a player to use his Game Boy Colour character on the Nintendo 64 version of the game. When Wario hits a power shot it sparks electricity! Wario's character wears pink shoes in the game (his shoes are usually green). In the next Mario sports title "Mario Tennis" however his shoes are back to regular green! At the start of the Game when the intro says Welcome to Mario Golf you can hear Wario in the background say "It shoulda been Wario Golf!" The European version of the game has a different into soundtrack to that of its counterparts in the rest of the world.